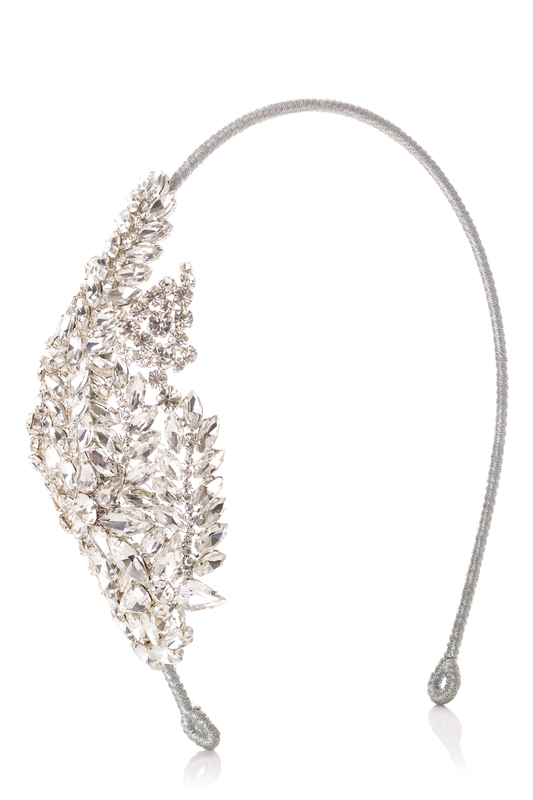 Our selection of unique tiaras are elegant and eye-catching. Set with Swarovski crystals, semi precious stones and fresh water pearls, these statement head pieces will ensure a flawless finish, completing your unique look. 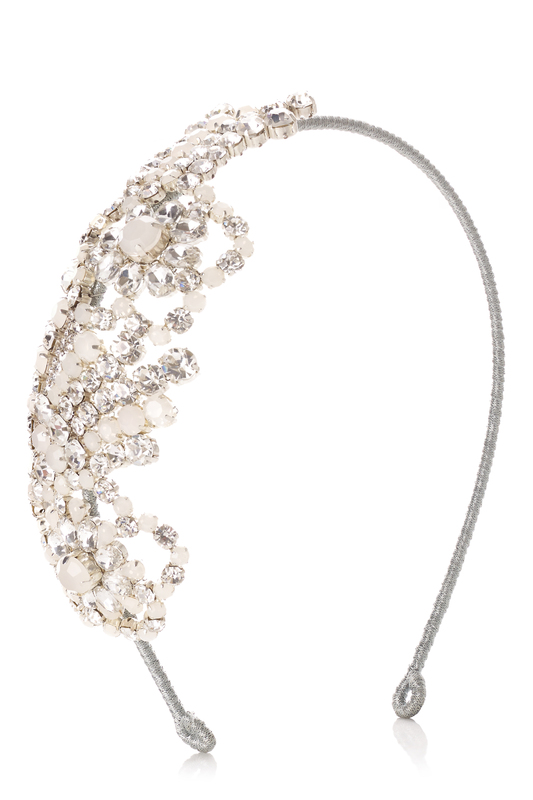 Our tiaras can be combined with a veil or worn on its own, the crowning expression of fashion on a bride’s ensemble. More headpieces and tiaras can be viewed in our Knightsbridge flagship store. Delicacy is delivered in this ornate bridal headdress. Large oval crystals are intermixed with smaller square crystals to form a statement leaf motif, stunningly set on a premium silver headband. Evoke opulence and majestic properties for your wedding day aesthetic. Exquisitely constructed from a plethora of iridescent crystals, this striking silver bridal headdress offers celestial craftsmanship and a flair of vintage decadence. Crystal bugle beads are set amongst oval and baguette iridescent crystals, to deliver a bow shaped aesthetic. Embodying all the glamour of old Hollywood whilst emulating a modern majestical mood, this refined and romantic bridal headdress delivers on opulence and ethereal craftsmanship. An open filigree focal feature is delicately handcrafted with pear drops and oval crystals, wrapped over a deluxe silver headband. 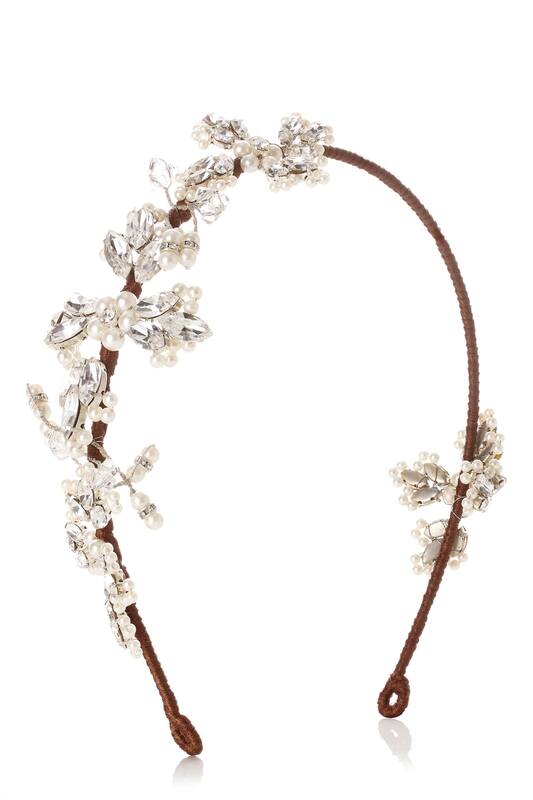 A majestic crystal foliage motif dances around a bronzed headband in this contemporary take on vintage bridal millinery. The Fedosia bridal headdress comprises a 3D floral focus, luxuriously constructed from iridescent crystals, gleaming pearls and ornate crystal bugle beads. 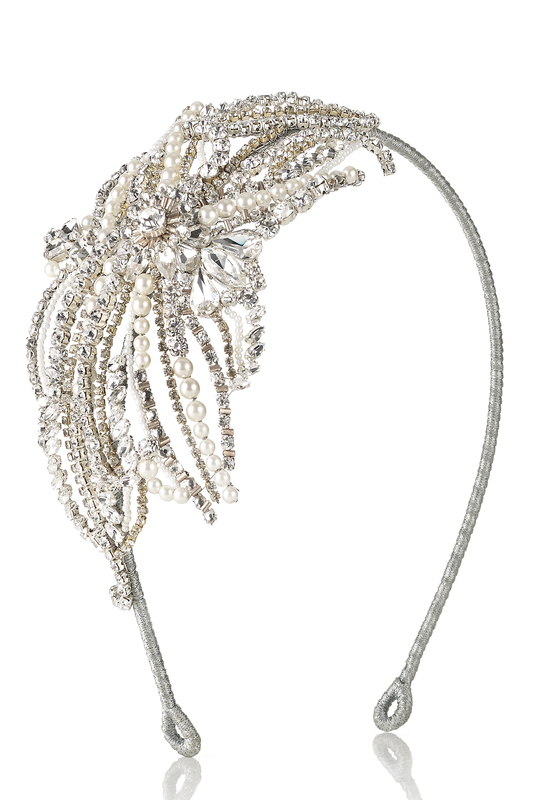 Lavish artistry is evident in this exquisite, elegant bridal headpiece. Majestic iridescent crystals are glamorously constructed to reveal an off-centre bejeweled crown focal point. Pearls are placed delicately amongst large pear and oval crystals and smaller translucent crystal segments. 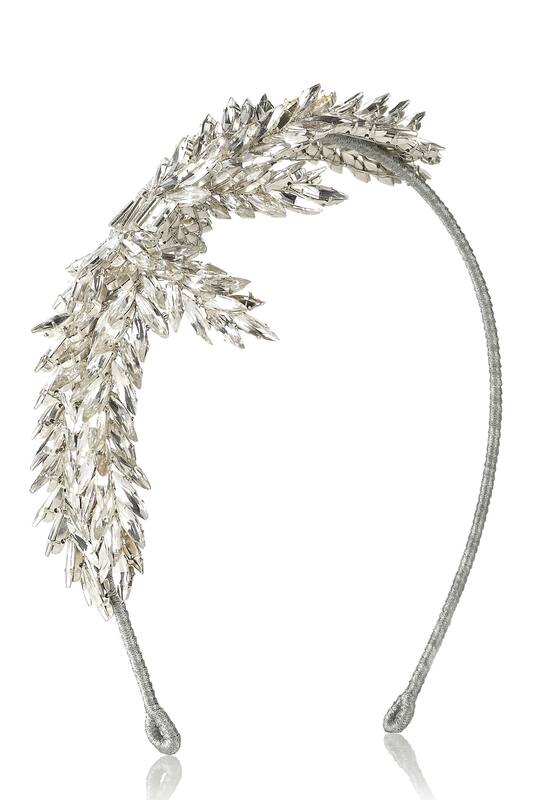 Exquisite ethereal details unite with opulent celestial charm in this modern interpretation of vintage millinery. 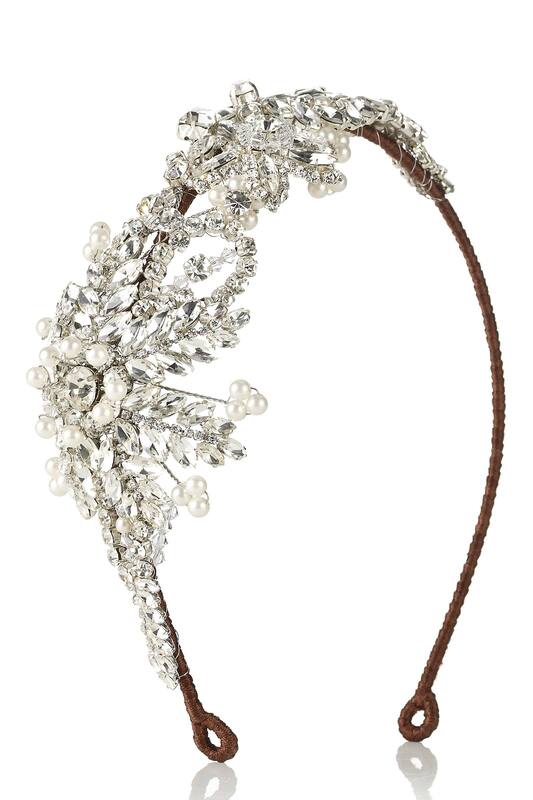 Delicate pearls are married with gleaming iridescent crystals, clustered to the side of a structured bronzed headband on the Izolda bridal headdress. 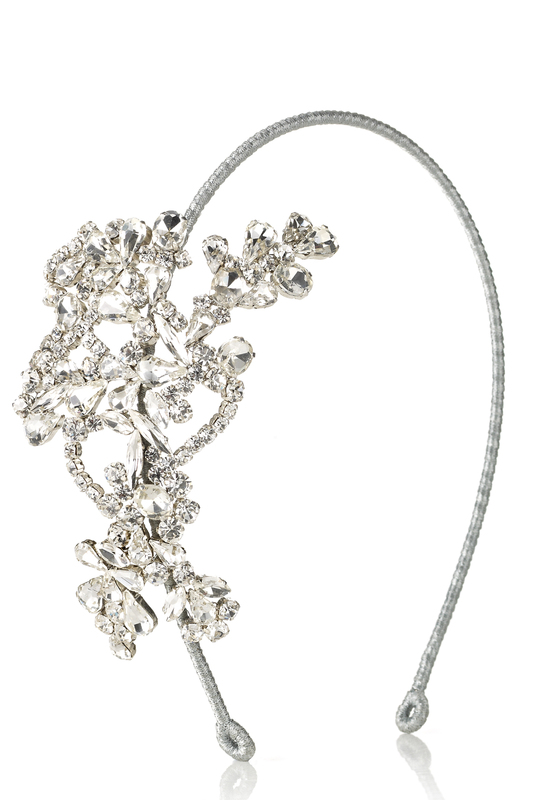 Elegant artistry amalgamates with intricate silverwork with this exceptionally exquisite bridal headpiece. Whimsically constructed with an off-centre focal feature, dazzling round and white crystals swirl into rows creating the charming aesthetic of a glamorous flower. 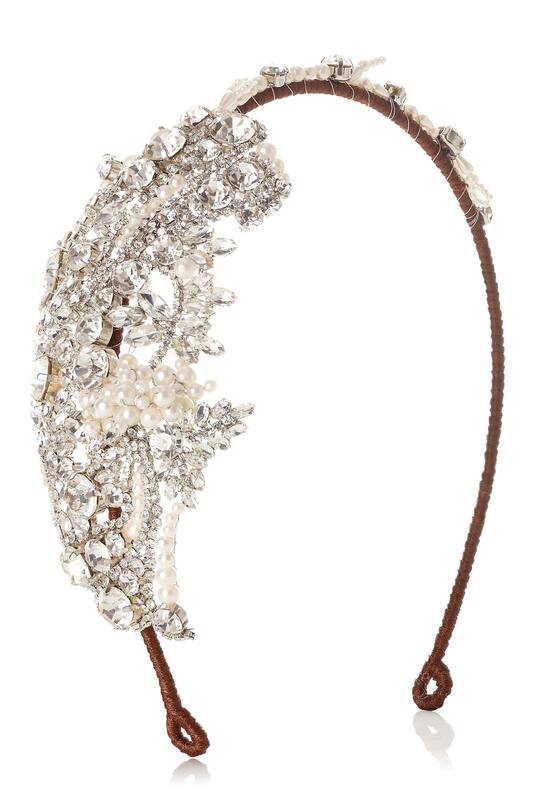 Translucent crystal and pearl floral enhancements enrich a bronzed headband in this Caroline Castigliano headdress. Providing opulence, grace and gleaming properties to instantly elevate your wedding day aesthetic, it’s meticulously crafted with large oval crystals interspersed with smaller crystals and pearls to form a delicate floral arrangement.